Luckyfinds: If you love Chocolate, you’ll love Auntie Anne’s KitKat Wind Upz! 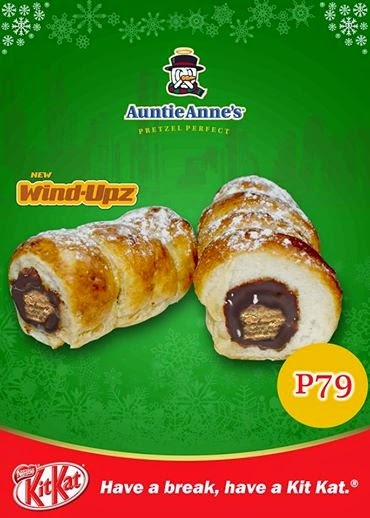 If you love Chocolate, you’ll love Auntie Anne’s KitKat Wind Upz! The pretzel haven that Auntie Anne's built has been working hard to make this holiday season perfect just for you! This unique treat will surely tickle your taste buds! Auntie Anne's has partnered with KitKat to take healthy snacking to a whole new level with the brand new Kit Kat Wind-Upz! Wind-Upz are Kit Kat wafers wrapped in Auntie Anne's hand-rolled, hand-twisted and freshly-baked dough. These crunchy pretzel rods will surely satisfy snack your cravings, plus provide a healthier alternative to chips. The Kit Kat Wind-Upz is one for the Chocoholics in the room! Go visit Auntie Anne's branches in Metro Manila, Cebu, Baguio and Davao now to enjoy this handful of chocolate goodness! KitKat Wind Upz is up for grabs this Holiday Season only!